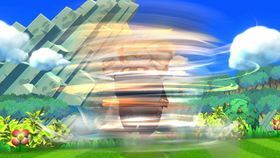 Meta Knight appears in a tornado spin. Meta Knight is a recurring anti-hero character in the Kirby series, making his debut in Kirby's Adventure. He always wears his metal mask in his series, and usually appears as a rival or a boss Kirby must fight, but on occasions has had to team up with him. He and Captain Vul are captains of the Halberd ship. In certain games, after Meta Knight is defeated, his mask splits into two, revealing a face near identical to Kirby's; the main difference being his blue skin tone. He has made crossover appearances with the Mario franchise, mostly in the Super Smash Bros. series. Although he does not appear as a playable character, Meta Knight has a trophy in Super Smash Bros. Melee, which can be randomly obtained. The trophy's title says Meta-Knight, referring to the group rather than the individual. Meta Knight's artwork from Super Smash Bros. Brawl. Meta Knight appears as a playable fighter in Super Smash Bros. Brawl. He is a small, quick fighter with fast yet weak attacks. Like in the Kirby series, Meta Knight's cape can transform into a pair of wings which not only grant him multiple jumps but also the ability to glide. His ship, the Halberd, also appears as a stage. Meta Knight's voice actor from the Kirby anime series, Atsushi Kisaichi, provides Meta Knight's voice in the Japanese version Super Smash Bros. Brawl, while Eric Newsome, who provided Bowser's voice in Super Paper Mario, voices him in other versions. Meta Knight's special moves are mostly based on attacks that appear in the Kirby series, his own or otherwise. His standard special is Mach Tornado, which causes Meta Knight to spin around rapidly to deal damage. His side special is Drill Rush, in which Meta Knight charges forward in a spinning motion. His up special is Shuttle Loop, in which he loops around before flying directly up, dealing two hits afterward. His down special is Dimensional Cape, in which Meta Knight teleports and can attack by holding the button. His Final Smash is Galaxia Darkness, in which Meta Knight traps opponents by swiping his cape then deals a large sword swipe. Meta Knight's story starts before the events of the actual game, trying to defend the Halberd from Master Hand and the Subspace Army, but was unwittingly prevented from doing as such by King Dedede. His actual first appearance is when he runs into Marth, who is investigating the activity going on in the Battlefield Fortress. After a brief duel, they team up to take on the Subspace Army. Afterwards, they are chasing the Ancient Minister when Ike shows up to disarm the Subspace Bomb the Minister had been carrying. Meta Knight, Marth, and Ike ultimately lose the Ancient Minister near the edge of the Wilds, but they find Galleom in the middle of the desert. After it is defeated, Galleom goes to the Ruined Hall and comes out holding Lucas and the Pokémon Trainer in one hand, with a Subspace Bomb about to go off in its head. Although Lucas manages to free himself and the Trainer, Meta Knight saves them when they almost hit the ground. Meta Knight finally finds the Halberd fighting the Great Fox above the Glacial Peak, and leaves his team behind to climb the mountain. As he does this, however, the Ice Climbers race him and beat him to the top. At the summit, Meta Knight discovers the Aura Pokémon Lucario, who challenges him to a duel. The duel ends, the loser gets turned into a trophy and the winner taps on the trophy base to recover him. After the battle, Meta Knight and Lucario agree to team up and enter the Halberd, where they find Solid Snake thanks to the use of Lucario's Aura. The three of them rescue Peach and Zelda from their evil counterparts before heading to the cockpit to find many Mr. Game & Watches controlling the Halberd. Lucario and Snake take care of them while Meta Knight takes the Halberd back. Eventually, Meta Knight goes into Subspace with everyone else, although the Halberd is destroyed by the Subspace Gunship as they do this. They find Tabuu, who fires his Off Waves at them and turns them into trophies. Kirby, however, is revived by one of King Dedede's badges and saves Meta Knight along with some of the others before going into the Great Maze to stop Tabuu. Meta Knight's artwork used in Super Smash Bros. for Nintendo 3DS / Wii U.
Meta Knight returns as a playable character for Super Smash Bros. for Nintendo 3DS and Super Smash Bros. for Wii U. He, along with other winged characters Pit and Charizard, can no longer glide, either normally or at the end of Shuttle Loop, though Shuttle Loop now hits twice instead. Aside from this, however, Meta Knight's moveset has not been changed. His design has been slightly altered for this installment, giving him metal gauntlets over his gloves. Meta Knight's mobility is improved, but his overall damage output is toned down, his recovery is worsened, his attacks are slower, and their range is decreased. 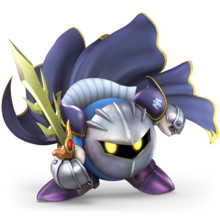 One of Kirby's alternative palettes is identical to what Meta Knight looks like without his mask (though the palette has yellow eyes), armor and cape in the early Kirby games. In addition, two of Meta Knight's new alternate costumes are based on Dark Meta Knight and Galacta Knight. Meta Knight returns in Super Smash Bros. Ultimate as an unlockable playable character. Meta Knight benefits from universal changes: his mobility is faster, his short hop timing is shortened, the landing lag in his aerials is reduced, the reintroduction of directional air dodging extends his recovery, and he gains the abilities to use any ground attack out of a run and his aerial attacks on ladders. Meta Knight also receives direct improvements, such as his forward tilt and forward and back aerials having larger hitboxes, and his dash attack and up and down smashes dealing more damage. Meta Knight can be unlocked by playing VS. matches, being the 38th character to be unlocked. Meta Knight can also be unlocked by clearing Link's Classic Mode route, being the fourth character unlocked after Simon. In the adventure mode, Meta Knight is not seen when the fighters oppose Galeem for the first time. 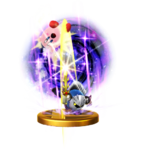 However, he, like every fighter except Kirby, is hit by one of Galeem's beams of light and imprisoned in the World of Light, where a puppet fighter of him is created. While the Meta Knight puppet fighter initially serves Galeem, Dharkon later takes control of the puppet fighter. 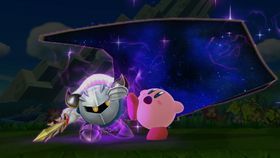 Kirby's team defeat the Dharkon-controlled Meta Knight puppet fighter and free the real Meta Knight, who joins them against Galeem and Dharkon. Mach Tornado is one of Meta Knight's abilities in the Kirby series, namely Kirby Super Star and its remake, which appears as Meta Knight's standard special move. When used, Meta Knight spins around rapidly, creating a whirlwind around himself that traps opponents and deals damage to them, with the final hit dealing greater damage and knockback. The move lasts longer if the player continuously presses the button, which also gives the move some vertical height, and the player can also move while using the move; the vertical and horizontal distance this move receives are both greater in the air. When the move ends, Meta Knight enters a helpless state if he is in the air. The custom variants for this move in Super Smash Bros. for Nintendo 3DS / Wii U are Entangling Tornado and Dreadful Tornado. Entangling Tornado draws in opponents and deals a single hit with greater knockback, but it offers less horizontal control than Mach Tornado, as well as much less damage. In Super Smash Bros. Ultimate, Mach Tornado itself is reworked into a single-hitting attack. Thus, it deals higher knockback and travels quicker, but has a hampered damage output and no extra maneuverability, due to the loss of the ability to button mash. Dreadful Tornado deals more powerful hits and offers much stronger knockback, but its duration cannot be extended by tapping the special move button. The move also has more ending lag than Mach Tornado, which leaves Meta Knight vulnerable to counterattacks. Drill Rush (originally known under the name Triple Dash) is Meta Knight's side special move in Super Smash Bros. Brawl and Super Smash Bros. for Nintendo 3DS / Wii U. It is based on the move of the same name when Kirby obtains the Master ability in Kirby & The Amazing Mirror. Meta Knight flies forward in a spinning motion, continuously hitting any opponents in his path for the move's duration. While Meta Knight is moving, the player can change his trajectory by tilting the Control Stick or Circle Pad. If the attack ends in the air, Meta Knight is left in a helpless state, unable to use another move until he lands. 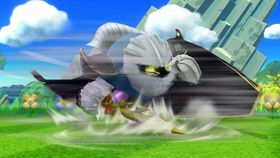 In Super Smash Bros. for Nintendo 3DS / Wii U, hitting a surface while Meta Knight is in motion causes him to bounce off of it, automatically ending the move. In Super Smash Bros. Ultimate, Drill Rush's hits connect more reliably, while its final hit deals more knockback. The first variant is High-Speed Drill, which increases the speed and the distance of the move, but it deals less knockback than Drill Rush, and its trajectory can't be altered either. The second variant is Shieldbreaker Drill, which delivers greater damage to shields, but it deals less knockback overall, and does not travel as far as the other Drill Rush variants. Shuttle Loop is a move originally used by Wing Kirby in Kirby Super Star incorporated as Meta Knight's up special move. Meta Knight leaps up into the air, slashing once, and loops around before flying up higher. 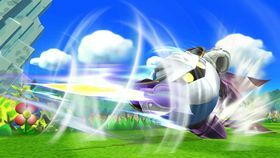 In Super Smash Bros. Brawl, this move automatically enters into Meta Knight's glide, while in Super Smash Bros. for Nintendo 3DS / Wii U the move ends with Meta Knight dealing a second attack, and then entering a helpless state. Blade Coaster enables Meta Knight to travel forward instead of up, enabling him to cover more distance horizontally, but it offers less vertical distance, and takes a bit longer to start up. Opponents who are hit by this attack are sent flying at a lower angle. Lazy Shuttle Loop has Meta Knight performing a slower loop before striking with a single attack. It offers more vertical distance than Shuttle Loop. However, it also removes the initial hit that Meta Knight performs before starting the attack. Dimensional Cape is Meta Knight's down special move. When used, Meta Knight disappears and reappears, facing the opposite direction. By holding down the button, Meta Knight attacks when he reappears, and tilting the Control Stick or Circle Pad causes Meta Knight to reappear in that direction. When used in the air, Meta Knight enters a helpless state. The first is Shield Piercer, which makes Meta Knight's attack unblockable, but its startup lag and ending lag are increased, and it deals much less damage and knockback than normal, making it more risky to use against low damaged opponents. It also does not travel as far as Dimensional Cape. Oddly, despite being unblockable, Bayonetta's Witch Time can counter Shield Piercer. The second variant is Stealth Smasher, where Meta Knight travels farther than normal, and his attack deals more damage as well. However, despite its name, the move does telegraph where Meta Knight will strike, which makes it easier for opponents to detect Meta Knight's location, and even counter his attack. Galaxia Darkness is Meta Knight's Final Smash. 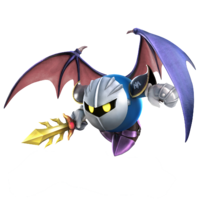 When used, Meta Knight swipes his cape forward, trapping any nearby opponents as the screen turns dark. Meta Knight then slashes down the screen, dealing high damage and knockback to all caught opponents, and opponents outside of the attack. If the cape doesn't catch any opponents, the Final Smash fails. In Super Smash Bros. Brawl, the screen goes dark when using the move, but in Super Smash Bros. for Nintendo 3DS / Wii U, an image of a galaxy appears before Meta Knight launches his attack. 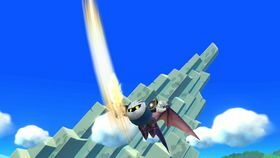 In Super Smash Bros. Brawl, during a team battle, this Final Smash can damage even Meta Knight's teammates, regardless of whether or not team attacks are turned off. This was later fixed in Super Smash Bros. for Nintendo 3DS / Wii U, where the attack only damages teammates when team attacks are turned on. Meta Knight appears in his Kirby's Adventure appearance in Super Mario Maker as a Mystery Mushroom costume. It can be unlocked randomly after completing the 100 Mario Challenge on Normal difficulty or higher, or unlocked by scanning any Meta Knight amiibo. Mei Ling: That's Meta Knight. He's a knight from Dream Land. They say his sword swings can break the sound barrier. Whatever you do, don't get caught in one of his furious barrage attacks. He also commands the Halberd, a flying battleship. Snake: Mm, I've seen it. The bow looks like his mask. What kind of weirdo puts his face on the bow of a ship, anyway? Mei Ling: Umm, maybe he's a little narcissistic. Kind of like someone else I know. Snake: Really... And who would that be? NES Kirby's Adventure The head of the Meta-Knights, and something of a rival to Kirby. He's quite an accomplished swordsman. Following his code of knightly ethics, he once delivered his sword to Kirby and demanded single combat. His giant cape transforms into wings, giving him the power of flight. He's shown his face briefly before, but his relationship to Kirby is still a mystery. SNES Kirby Super Star (08/1996) NA: Kirby's mysterious rival, this masked swordsman appears in several Kirby games. His cape transforms into wings to grant him flight. In Smash Bros., his quick sword skills and aerial agility set him apart. He can jump up to five times in a row, and he has a special move to soar higher. PAL: A mysterious masked swordsman from the Kirby series. His cape can turn into wings, which gives him the ability to fly. His swift swordplay and ability to stay in the air give him an edge in this game. He can combine five mid-air jumps with a special move to make recovering a cinch. If you use him, try to keep battle airborne. SNES Kirby Super Star (08/1996) NA: Meta Knight's Dimensional Cape lets you teleport, changing where you'll reappear with directional inputs and attacking by holding the button! His Mach Tornado special can draw in and attack multiple opponents. Rise by pressing the button repeatedly, and press left or right to move. PAL: Meta Knight's Dimensional Cape lets you teleport. After vanishing, you can move to reappear somewhere else. You can also keep holding the button to turn it into an attack! His Mach Tornado special can mix up multiple opponents in the fray. Press the button repeatedly to rise up, and move left and right to create extra havoc. Galaxia Darkness Meta Knight swings his cape to ensnare foes. Darkness falls, enveloping them in an empty void and then a giant sword slash cleaves the blackness. If the cape doesn't capture anyone, this Final Smash will fail. It has more range than you might think, though and you only have to catch one foe to deal damage to everyone! Pit: I wonder what Meta Knight looks like under that mask. Viridi: Apparently quite similar to Kirby. Pit: If he took off his mask, could he inhale things too? Viridi: Maybe. And maybe he has Kirby's Copy Ability as well. Viridi: Well, then he'd just be back where he started. Palutena: Anyway, be careful of his quick blade and his spinning attacks. They don't have a lot of power, so use your shield until you see an opening. Kirby's mysterious rival, this masked swordsman appears in several Kirby games. His giant cape transforms into wings, giving him the power of flight. He also captains a giant battleship, the Halberd, in order to take control of Dream Land. Meta Knight has shown his face briefly before, but his relationship to Kirby is still a mystery. Meta Knight is also in both versions of Nintendo Monopoly, where he takes the position of St. Charles Place, and costs $140. In Super Smash Bros. Brawl, Meta Knight is the only character who does not share a victory theme with the other characters from his series. In Super Smash Bros. for Nintendo 3DS / Wii U, other characters shared this trait as well, such as Bowser, Rosalina and Dark Pit. Meta Knight is the only Kirby series character in the Super Smash Bros. series that speaks in full dialogue, aside from Knuckle Joe. In addition, Super Smash Bros. Brawl is the first game in which Meta Knight has a voice actor. ↑ Sakurai, Masahiro (translated). (August 28, 2007.) Four Special Move Types. Smash Bros. DOJO!! (Wayback Machine.) Retrieved May 8, 2015. This page was last edited on March 16, 2019, at 19:23.